Getting help with VMware Site Recovery Manager (SRM) can be a rendition of Mission: Impossible. In this tip, we go over basic VMware Virtual Machine File System volume properties, what VMware SRM resignaturing is, and why it's important. Virtual Machine File System (VMFS) resignaturing. Whether you use SRM or choose to do your disaster recovery (DR) manually, VMFS resignaturing is important for all VMware admins to understand. Without a good understanding of VMFS, resignaturing is an important part of what goes on in the background that will remain a mystery to you, and troubleshooting will be tricky. If you don't own the VMware SRM product, the first step after presenting a replicated volume or LUN to your ESX hosts is the resignaturing process. As a VMware Certified Instructor (VCI) I've often thought that replication and resignaturing has been glossed over in the official courseware; however, for most VMware shops replication is an essential part of their data recovery and disaster recovery strategy. Before I begin, it's important to emphasize that this does not apply to Network File System (NFS) volumes; it only applies to the VMFS when accessed by block-level storage such as Fibre-Channel or iSCSI. Let's begin by reviewing some properties of VMFS volumes. It's important to know that as with the NAA, the UUID value must be completely unique and an ESX host cannot have two UUIDs that are exactly the same presented to it at the same time. UUIDs are generated by using three core variables, including date, time and LUN number in order to guarantee that the UUID value be absolutely unique. This can cause some interesting, or shall I say unpleasant consequences if you are not consistent in your LUN numbering. That is to say problems can occur if ESX1 believes the LUN/Volume number is 15, and another ESX hosts believes the same block of storage is LUN/Volume 20. It's also worth saying that currently virtual machines do not find their VMDK and VSWP files using the friendly volume/data store name. 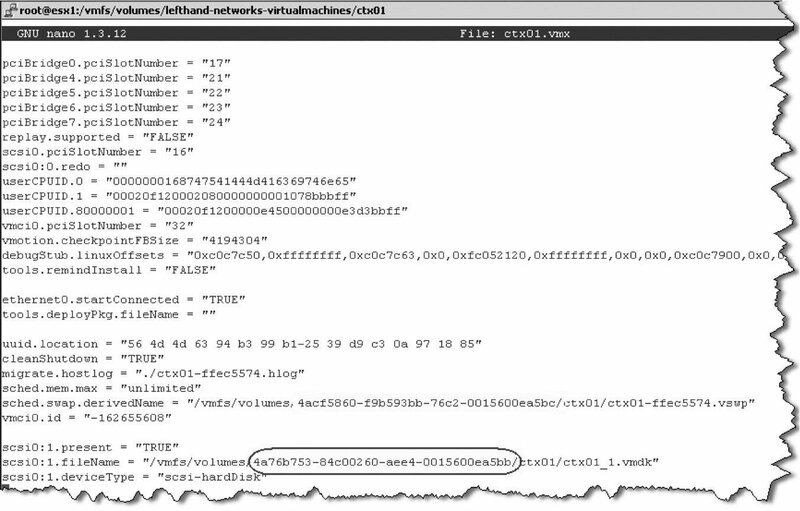 If you examine the contents of a .VMX file you will see references to the UUID value. Note: In this image you can see that the second virtual disk (ctx01_1.vmdk) is being stored on a different volume (..ea5bb) to the VMs Vmkernel swap file (...ea5bc). If the virtual disk is stored in the same location as the VMX file, then the /vmfs/volumes path is not displayed in the VMX file, but it is used. As you can see, UUID numbers are very important. The requirement for unique UUIDs does present some interesting challenges to DR. By definition, any snapshot or replication process configured in the array is intended to create an exact duplicate of the VMFS volume, which would by definition include the UUID value. I n the next two parts of this series, we'll go over exactly how SRM resignatures the volumes. Stay tuned.